Set includes long sleeve 'Forever' print black bodysuit, comfy pants and matching bib. Essential for every newborn and great for gift for baby showers that new parent will appreciate! Elastic-waist stripe print basic comfy pants. Pant Length 17. Sleeve 10.5". Top Length 13". Carters3 peice set jacket, bodysuit,pants,polar bear red checks ,black nwt. Condition is New with tags. Shipped with USPS Priority Mail. Size: 12M, 18M, 24M. Type: Outfit - Vest With Zipper Closure & 2 Pockets, L/S Hooded Top, Denim Pant W/Elastic Waistband, Button Closure, No Zipper & 4 Pockets. Vest: 100% Polyester. Pant: 100% Cotton. NWT Under Armour Toddler Baby Boys Heat Gear Shirt Black Sz 3T New. Condition is New with tags. Shipped with USPS First Class Package. Bakugan Boys Toddlers Shirt-Pants 2pc. Fleece Set Sz 4. Bakugan Boys Toddlers 2pc. Fleece Set. This Bakugan 2 Pc. 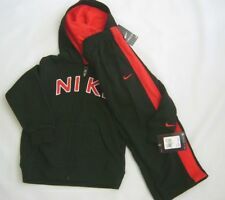 Fleece set is of black and red color. It Has coolTeam Pyrus Graphics embossed on its front. Vitamins Baby Little Explorer 6 Month Old 4 Piece Outfit. Comes with pants, socks, bodysuit, and hat. Condition is New with tags. Shipped with USPS First Class Package. BATMAN: Has Designed Hi-Fashion Superior Quality Outfits with Boldness and Elegance While Still Remaining Affordable. Boys Premium Outfit. Elegantly Attractive Outfit YOU CAN LIVE IN. Superior Taliored Fit Taking It to the Next level. SWEATPANTS ARE BLACK WITH RED STRIPES DOWN THE SIDES. SIZE IS LITTLE BOY'S 3T.